China is a victim of cyber attack. With 802 million internet users, including 788 million mobile surfers, and a $3.95 trillion (£3.1 trillion) digital economy, which accounts for 32.9pc of its GDP, China is an easy target. In 2017 alone, China suffered close to $60 billion in economic loss due to cyber security problems where 93.5pc of ransomware attacks in China were launched overseas. 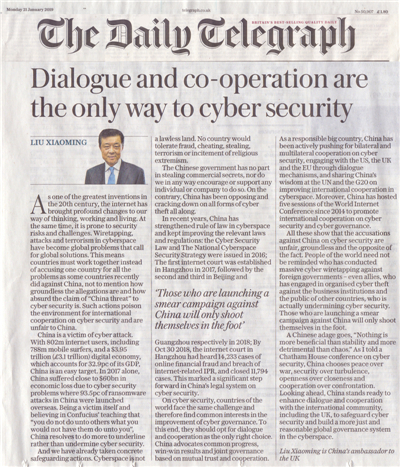 Being a victim itself and believing in Confucius' teaching that "you do not do unto others what you would not have them do unto you", China resolves to do more to underline rather than undermine cyber security. In recent years, China has strengthened rule of law in cyberspace and kept improving the relevant laws and regulations: The Cyber Security Law and The National Cyberspace Security Strategy were issued in 2016; The first internet court was established in Hangzhou in 2017, followed by the second and third in Beijing and Guangzhou respectively in 2018; By October 30, 2018, the internet court in Hangzhou had heard 14,233 cases of online financial fraud and breach of internet-related IPR, and closed 11,794 cases. This marked a significant step forward in China's legal system on cyber security. On cyber security, countries of the world face the same challenge and therefore find common interests in the improvement of cyber governance. To this end, they should opt for dialogue and cooperation as the only right choice. China advocates common progress, win-win results and joint governance based on mutual trust and cooperation. 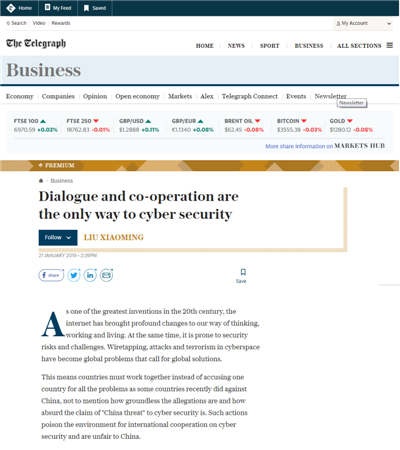 As a responsible big country, China has been actively pushing for bilateral and multilateral cooperation on cyber security, engaging with the US, the UK and the EU through dialogue mechanisms, and sharing China's wisdom at the UN and the G20 on improving international cooperation in cyberspace. Moreover, China has hosted five sessions of the World Internet Conference since 2014 to promote international cooperation on cyber security and cyber governance. All these show that the accusations against China on cyber security are unfair, groundless and the opposite of the fact. People of the world need not be reminded who has conducted massive cyber wiretapping against foreign governments - even allies, who has engaged in organised cyber theft against the business institutions and the public of other countries, who is actually undermining cyber security. Those who are launching a smear campaign against China will only shoot themselves in the foot.